WHO has conducted an in-depth assessment of the latest evidence on the efficacy and safety of anti-tubercular medicines by an independent panel of experts (July 2018) and has come up with new consolidated, updated and more detailed WHO policy guidelines which will be released later this year. The new regimens are based on evidence from various sources including, an IPD database with over 12,000 patient records from 50 studies, new data from 26 countries, aggregated results from the Otsuka phase 3 RCT on delamanid and STREAM stage 1 RCT (both released in Oct 2017) and PK & safety data from trials of bedaquiline delamanid in children. According to the latest recommendations, medicines have been regrouped into 3 categories and ranked based on the latest evidence. The ranking and choice of agents are not only based on balancing effectiveness and safety but also determined by preference for oral drugs, results of drug-susceptibility test (DST), drug resistance levels, previous medication history of patients, tolerability and drug-drug interactions. GROUP C (medicines to be included to complete the regimens and when agents from groups A & B cannot be used): ethambutol, delamanid, pyrazinamide, imipenem-cilastatin, meropenem, amikacin	(streptomycin),	ethiona-mide/prothionamide, p-aminosalicylic acid. Kanamycin and capreomycin are no longer recommended by WHO considering increased risk of treatment failure and relapse. Other information including duration of treatment, dosing in adult and children, treatment of XDR-TB will be provided at the time of release of the final WHO guidelines. Source: WHO | Rapid Communication: Key changes to treatment of mul-tidrug- and rifampicin-resistant tuberculosis (MDR/RR-TB) [Internet]. WHO. [cited 2018 Aug 20]. The Ministry of Health and Family Welfare, New Delhi has issued a public notice early this month requesting suggestions and comments on the new name for the Indian drug regulator ‘Central Drugs Standard Control Organization (CDSCO)'. The drug regulator got its present name in the mid 1940s keeping its role in view when it was created. However, the Health Ministry now feels that the present name does not reflect its current roles and responsibilities. As reported in the notice, over the last seven decades, the role of CDSCO has expanded to several areas including regulation of new drugs, vaccines and clinical trials; regulating import of drugs, medical devices and cosmetics; licensing blood banks, vaccines, sera etc. ; setting standards under the Drug and Cosmetics Act 1940; control over emerging areas such as stem cells, e-pharmacy etc. National Drug Authority (NDA), Central Drug Authority (CDA), Indi-an Drugs Administration (IDA) and Indian Medical Products Admin-istration (IMPA) are some of the recommendations already presented by eminent institutions in India. In view of the above, the Health Ministry has decided to rename CDSCO and also to permanently replace its current logo. The public can also send in their suggestions and comments on the new name and the design of the new logo to dci@nic.in. Source: Central Drugs Standard Control Organization [Internet]. [cited 2018 Sep 21]. The Nobel Assembly at Karolinska Institutet has awarded the 2018 Nobel Prize in Physiology or Medicine jointly to James P. Allison and Tasuku Honjo for their discovery of cancer therapy by inhibition of negative immune regulation. Cancer kills millions of people every year and is one of humanity’s greatest health challenges. By stimulating the inherent ability of our immune system to attack tumor cells this year’s Nobel Laureates have established an entirely new principle for cancer therapy. James P. Allison studied a known protein that functions as a brake on the immune system. He realized the potential of releasing the brake and thereby unleashing our immune cells to attack tumors. He then developed this concept into a brand new approach for treating patients. In parallel, Tasuku Honjo discovered a protein on immune cells and, after careful exploration of its function, eventually revealed that it also operates as a brake, but with a different mechanism of action. Therapies based on his discovery proved to be strikingly effective in the fight against cancer. Allison and Honjo showed how different strategies for inhibiting the brakes on the immune system can be used in the treatment of cancer. The seminal discoveries by the two Laureates constitute a landmark in our fight against cancer. Cancer comprises many different diseases, all characterized by uncontrolled proliferation of Accelerators and brakes in our immune system abnormal cells with capacity for spread to healthy organs and tissues. A number of therapeutic approaches are available for cancer treatment, including surgery, radiation, and other strategies, some of which have been awarded previous Nobel Prizes. These include methods for hormone treatment for prostate cancer (Huggins, 1966), chemotherapy (Elion and Hitchins, 1988), and bone marrow transplantation for leukemia (Thomas 1990). However, advanced cancer remains immensely difficult to treat, and novel therapeutic strategies are desperately needed. In the late 19th century and beginning of the 20th century the concept emerged that activation of the immune system might be a strategy for attacking tumor cells. Attempts were made to infect patients with bacteria to activate the defense. These efforts only had modest effects, but a variant of this strategy is used today in the treatment of bladder cancer. It was realized that more knowledge was needed. Many scientists engaged in intense basic research and uncovered fundamental mechanisms regulating immunity and also showed how the immune system can recognize cancer cells. Despite remarkable scientific progress, attempts to develop generalizable new strategies against cancer proved difficult. The fundamental property of our immune system is the ability to discriminate “self” from “nonself” so that invading bacteria, viruses and other dangers can be attacked and eliminated. T cells, a type of white blood cell, are key players in this defense. T cells were shown to have receptors that bind to structures recognized as non-self and such interactions trigger the immune system to engage in defense. But additional proteins acting as T-cell accelerators are also required to trigger a full-blown immune response (see [Figure 1]). Many scientists contributed to this important basic research and identified other proteins that function as brakes on the T cells, inhibiting immune activation. This intricate balance between accelerators and brakes is essential for tight control. It ensures that the immune system is sufficiently engaged in attack against foreign microorganisms while avoiding the excessive activation that can lead to autoimmune destruction of healthy cells and tissues. Figure 1: Upper left: Activation of T cells requires that the T-cell receptor binds to structures on other immune cells recognized as “non-self”. A protein functioning as a T-cell accelerator is also required for T cell activation. CTLA-4 functions as a brake on T cells that inhibits the function of the accelerator. Lower left: Antibodies (green) against CTLA-4 block the function of the brake leading to activation of T cells and attack on cancer cells. 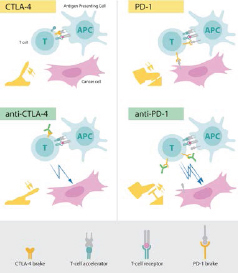 Upper right: PD-1 is another T-cell brake that inhibits T-cell activation. Lower right: Antibodies against PD-1 inhibit the function of the brake leading to activation of T cells and highly efficient attack on cancer cells. During the 1990s, in his laboratory at the University of California, Berkeley, James P. Allison studied the T-cell protein CTLA-4. He was one of several scientists who had made the observation that CTLA-4 functions as a brake on T cells. Other research teams exploited the mechanism as a target in the treatment of autoimmune disease. Allison, however, had an entirely different idea. He had already developed an antibody that could bind to CTLA-4 and block its function (see [Figure 1]). He now set out to investigate if CTLA-4 blockade could disengage the T-cell brake and unleash the immune system to attack cancer cells. Allison and co-workers performed a first experiment at the end of 1994, and in their excitement it was immediately repeated over the Christmas break. The results were spectacular. Mice with cancer had been cured by treatment with the antibodies that inhibit the brake and unlock antitumor Tcell activity. Despite little interest from the pharmaceutical industry, Allison continued his intense efforts to develop the strategy into a therapy for humans. Promising results soon emerged from several groups, and in 2010 an important clinical study showed striking effects in patients with advanced melanoma, a type of skin cancer. In several patients signs of remaining cancer disappeared. Such remarkable results had never been seen before in this patient group. In 1992, a few years before Allison’s discovery, Tasuku Honjo discovered PD-1, another protein expressed on the surface of T-cells. Determined to unravel its role, he meticulously explored its function in a series of elegant experiments performed over many years in his laboratory at Kyoto University. The results showed that PD-1, similar to CTLA-4, functions as a T-cell brake, but operates by a different mechanism (see [Figure 1]). In animal experiments, PD-1 blockade was also shown to be a promising strategy in the fight against cancer, as demonstrated by Honjo and other groups. This paved the way for utilizing PD-1 as a target in the treatment of patients. Clinical development ensued, and in 2012 a key study demonstrated clear efficacy in the treatment of patients with different types of cancer. Results were dramatic, leading to long-term remission and possible cure in several patients with metastatic cancer, a condition that had previously been considered essentially untreatable. Hodi, F.S., Mihm, M.C., Soiffer, R.J., Haluska, F.G., Butler, M., Seiden, M.V., Davis, T., Henry-Spires, R., MacRae, S., Willman, A., Padera, R., Jaklitsch, M.T., Shankar, S., Chen, T.C., Korman, A., Allison, J.P. & Dranoff, G. (2003). Biologic activity of cytotoxic T lymphocyte-associated antigen 4 antibody blockade in previously vaccinated metastatic melanoma and ovarian carcinoma patients. Proc Natl Acad Sci USA, 100(8), 4712–4717.